Garlic is a finicky thing. Some may say that even a little is too much, while others say that there can be no such thing as too much of good thing. 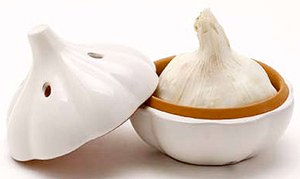 Whether you like, love or hate garlic, its pungency isn’t the only aspect that requires a little attention: Where the heck are you supposed to store the stuff? In the cupboard? In the fridge? On the counter? In a hanging basket with other fruits and vegetables, shedding garlic paper and imparting its essence to everything it touches? While you’re at it, might as well pick up this Garlic Chopper by Koopeh also. It features a rising bottom plate that pushes out stubborn garlic pieces—a timesaving highlight, considering how difficult it can be to clean hand-held garlic crushers. 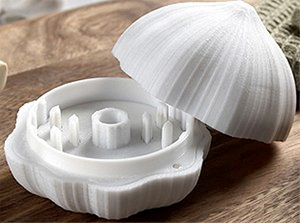 This garlic roundup featuring garlic gadgets is, of course, only the tip of the garlic bulb. One could outfit their whole kitchen with garlic-themed décor—which just might put to test the theory that their can never be too much of a good thing! 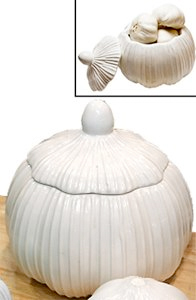 I really want the two garlic keepers from the top image but when I followed the link to MSC international a different website came up and these adorable keepers weren’t on that site. I know it’s been a long time from your post but do you know where they can be found nowadays on ontario?